Need CASH NOW to pay your bills? Through no fault of your own, you may find yourself short of money, even for the basic necessities of life such as mortgage or rent payments, purchasing a new car, paying of medical bills - you name it! We provide Pre-Settlement Litigation Funding, so you need not suffer financial hardship while you fight to get what you deserve! Pre-settlement litigation funding is a non-recourse cash advance, provided to an injured person in return for a promise to repay the advance after you win your lawsuit. The advance covers medical and health care related costs, expert witness, research, and attorney fees. The suit should be at least 4 months old with the likelihood that it will settle in no more than 18 months. The pre-settlement funding source would fund the client approximately 10 - 20% of the expected judgment in return for a lien against the entire award remaining. 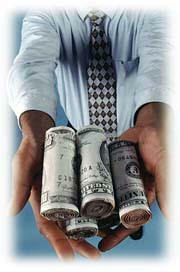 This lien follows any lien placed on the case for attorney or medical fees. By keeping the funded amount small, and by getting involved after a certain amount of time has passed, the actual cost to the client is very small relative to their increased gain. An injured person contacts us, sometimes at the suggestion of their attorney. After receiving permission from the client, we contact the attorney handling the case to obtain information about the case. Based on this information, we estimate the value of the case and the risk involved, and offer a cash advance to the plaintiff based upon that estimate. The fee may be a flat fee or a monthly percentage fee that accrues each month. The fee is paid after the case settles, and only if the client wins a judgment. These advances are non-recourse, which means that the plaintiff has no obligation to repay the advance if the lawsuit is lost. The amount advanced varies, depending upon the nature of the case, insurance company involved, how long the case has been active, and the expected settlement date. A question that seems obvious is, "Why can't injured people simply borrow money from their lawyers?" The answer is that state bar associations recognize that when a lawyer becomes a creditor to a client, a conflict of interest is created that may interfere with the attorney-client relationship. As a result, funding companies require that the client sign the contract, and that the attorney only sign an acknowledgement of the client's instruction that the advance and associated fees be repaid from the eventual verdict or settlement. Minimum funding amount in the State of North Carolina must be at least $25,000.